The Cameri Theatre production of Return to Haifa adapted by Boaz Gaon from the novella by Ghassan Kanafani (1936 – 1972), directed by Sinai Peter, will be performed at Theater J in Washington D.C. from January 15 – 30, 2011, anchoring the fourth annual Voices of a Changing Middle East Festival: Portraits from Home. Return to Haifa is a unique presence on the stage, breaking through the monolithic barriers of history and politics to tell a human story that cannot be conveyed through headlines or slogans. Written over forty years ago by Kanafani, the play centers on two couples. Sa’id and Saffiyah are forced to escape Haifa during the turmoil of 1948, somehow, in the chaos of war – their baby was left behind. Returning twenty years later to their former home, they find Miriam Goshen, a Jewish Holocaust survivor who has raised the boy as her own. Grappling with questions of identity, love, loyalty, justice, nature, nurture and the relationships between parents and children, the play does not content itself with easy answers. This imaginary encounter is both moving and thought-provoking, with an honest, empathic perspective that acknowledges the emotions without denying difficulty, recognizing the human suffering of all those involved in the conflict. Rosina Kambus is an accomplished Israeli actress who has received many accolades for her work, including an award from the Tel Aviv Municipality for her role in Return to Haifa. As Miriam Goshen, a woman and survivor whose world was torn asunder and rebuilt through nurturing her adopted son, Kambus offers a mesmerizing portrait of a complex woman reluctantly faced with a shifting reality. Erez Kahana wonderfully conveys the arrogance and vulnerability of a young man whose sense of identity is suddenly and abruptly questioned. The cast includes: Raida Adon, Suhil Hadad, Nissim Zohar and Misha Teplitzki. 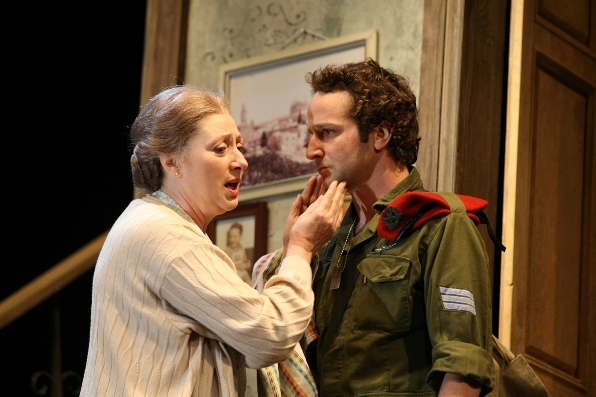 The play will be performed in Hebrew, with English surtitles. This will be the Cameri Theatre’s second visit to DC, following their 2007 performances at the Shakespeare festival with Hamlet, directed by Omri Nitzan and starring Itai Tiran. The Cameri’s participation in the Theater J festival was sponsored by the Israeli Ministry of Foreign Affairs – Kashtum. There may be changes to the schedule, please refer to the Theater J site for updates and further information.